The 1993 Penguin Book cover design. I was happy to re-read A Wizard of Earthsea again for my Readings in the Genres class at SHU because The Earthsea Quartet is one of a very few epic fantasy series I've loved. Although I could've taken the opportunity to write a formal review of the book, I wanted to focus on the concept of "whitewashing" Earthsea, and how often Le Guin has to step in to remind people that her lead characters are of many different, darker colors. She shouldn't have to constantly remind audiences what her characters look like, especially when she clearly describes them in the text, but she's had to anyway; which I think speaks to a larger and quite serious issue with race and the fantasy genre overall. Although modern fantasy continues to grow and thrive by exploring different worlds and races, there is still the perception that epic fantasy is stuck in Medieval Europe. To oversimplify, Medieval Europe =white people, usually of nobility or royalty. If Medieval Europe is the default world building model for high fantasy, that means high fantasy casts by default will also be white. Race may never matter to certain fantasy readers or writers…but even so, there are few novels that are said to define the entire fantasy genre like A Wizard of Earthsea. The fact that the book climbed to fame is a huge deal, because it's a fantasy that primarily involves a multi-racial cast. And yet for a book so powerful, it still meets with resistance--there is a population of readers, directors, producers, designers, etc.--who cannot seem to let the characters look the way the author intended. Compare this to the book cover above. Le Guin has been very vocal about this issue. Probably one of the most famous examples of her frustration is the Syfy channel's miniseries adaptation Earthsea, which combines and adapts the plots from A Wizard of Earthsea and the Tombs of Atuan. I remember when it debuted, and I watched maybe an hour of it and personally thought it sucked. On top of that, there was a glaring problem--aside from Ogion (Danny Glover) no other leads were of color. Especially Ged. Le Guin wrote a marvelous article for Slate magazine with the subtitle How the Sci-Fi Channel Wrecked My Books where she lambasted casting choices and felt like she had to apologize to her reading audience for the choices the network made without her approval. Her Slate article is probably the most famous, but she catalogued several of her various responses about the whitewashing of Earthsea, which you can read here. Another famous treatment of the Earthsea stories is Studio Ghibli's Tales from Earthsea which came out in 2006.The adaptation is visually gorgeous, though Le Guin's response to the filmmakers was, "It is not my book. It is your movie. It is a good movie." I think the film was created in the spirit of Earthsea without actually being a clean adaptation of her work, which is what I think Le Guin meant by her comments. I liked it far better than the other version of Earthsea I'd seen. Prince Arren and Ged, from Tales of Earthsea. In Goro Miyazaki's film, characters have dark brown or black hair, and although they're relatively light-skinned, there's at least an attempt to avoid the "ivory WASP" that dwells in epic fantasy.Ged, especially in the screencap I posted, does have a reddish-tan hue to his skin--which is better than blonde hair and blue eyes. Perhaps the most infuriating aspect of whitewashing (to me, anyway) of A Wizard of Earthsea are the actual book covers themselves. I could possibly understand why film ignores the wishes of authors simply because Hollywood has a long-established track record of ruining fiction (not that that's a good excuse); but since the original medium of the story is in fact a book, you'd think at least publishers would get it right. Nope. This article shows how with Earthsea, like many other books, publishers have falsely depicted character races on the actual book covers. An even more thorough article, One of the Most Whitewashed Characters in Fantasy/Science Fiction is Ged shows various interpretations. I feel incredibly lucky that the copy of the Earthsea Quartet I picked up in Carmarthen was the 1993 Penguin UK edition that depicted Ged mostly the way I imagined him in my mind. There's no mistaking it: every character on that cover has black hair and reddish-brown skin. I cannot think of any other better visual representation of the characters that has appeared on a book cover. But honestly, there should be more than one example of art in existence that properly reveals race in the series. Oh, wait a minute--I've found more art that actually depicts Ged with dark skin! 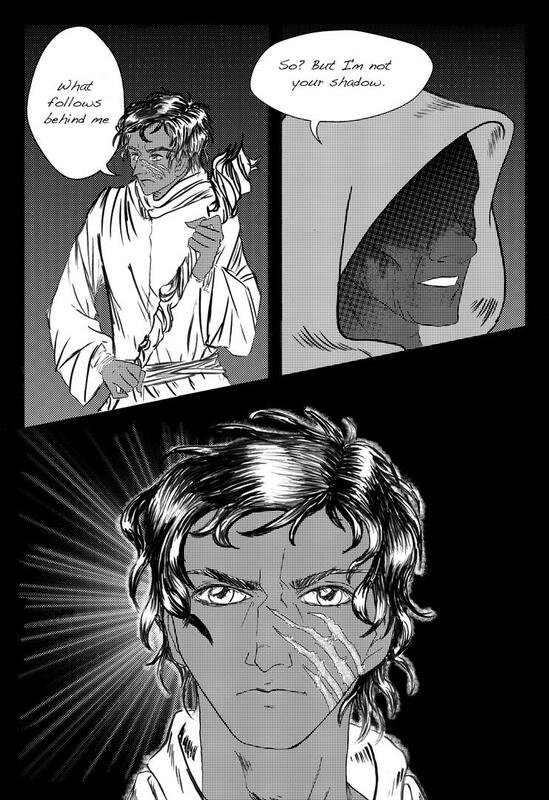 Earthsea comic art by deviant artist MelanieComics. What can writers do when these long-existing issues with race and whitewashing can't seem to go away? It would help to break down the old high fantasy tropes by writing fantasy that isn't defaulted to the white, European, medieval-based, traditional epic. But if writers start to break the mold, then writers should be prepared to defend their work as they have written it. Le Guin's Earthsea may have been horribly misrepresented multiple times, but she doesn't go down without a fight! LeGuin, Ursula K. The Earthsea Quartet. London: Penguin, 1993. Print. LeGuin, Ursula. "A Whitewashed Earthsea." Editorial. Slate.com. The Slate Group, a Division of the Washington Post, 16 Dec. 2004. Web. <http://www.slate.com/articles/arts/culturebox/2004/12/a_whitewashed_earthsea.html>. Hi Kristina, my name is Ken de Silva and I came across your article by chance and thought you might be interested in the genesis of The Earthsea Quartet 1993 Puffin covers. I was the commissioning art director in charge of updating theses covers. At the time I had not read them, but was aware of the previous Puffin editions, which had been illustrated with euro-centric Arthurianesque characters in a pre-Raphalite style, so I was very surprised to find on reading them that Ursula Le Guin's lead characters were clearly and specifically described as dark skinned. I am of Sri Lankan and Goan extraction and brown skinned, and the editor I was working with was a Veneta Gupta, who was of German and Goan extraction. We were determined to portray the characters as described in the book, and I commissioned the Dutch fantasy illustrator Peter Bergin for the project with this specific remit. I remember Peter coming back to me excitedly, saying he was walking down the street and had seen a guy who was the perfect Ged and had asked him to pose for him. When we received the rough visuals and showed them at the covers meeting there was a palpable discomfort and as I recall we were at some point told by the publisher that ethnic minority characters on covers do not sell books, just a fact, like green books were also supposedly unpopular. Mine and the editor's ethnicity played a part in gaining a tacit approval, they weren't rejected outright, and we were determined not to whiten the characters and proceeded with the commissions, Peter produced four beautiful artworks that were true to the text, and they proved to be both popular and successful. And it was extremely gratifying that Ursula Le Guin wrote a letter saying how pleased she was that she finally had covers to her books that reflected the ethnicity of her characters truthfully.The illustrations were adopted for the adult editions too, and their longevity proved all the nay sayers wrong. It was only after the event that I became aware of the issues Ursula Le Guin had had in the depiction of her Earthsea characters. When things get stressful, Art! Treatise on Maps and Fantasy, part II. Geek update: Akaneiro and Sword Art Online!